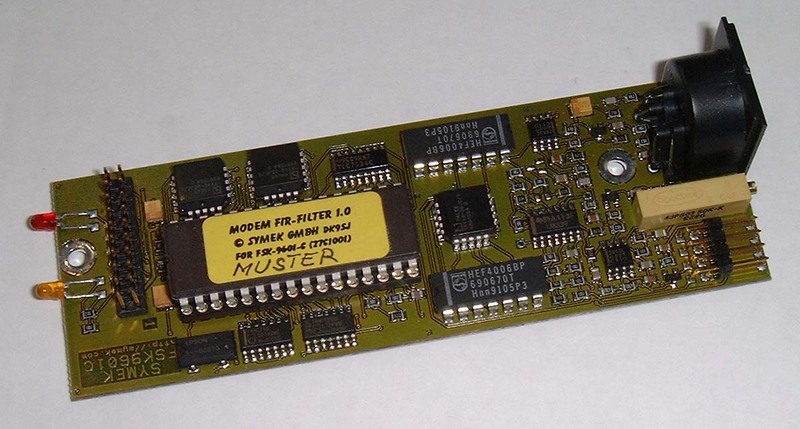 The FSK9601 is intended for use with the TNC3S or TNC31 Packet-Radio Controller. Dimensions: 120x40 mm. The modem is connected to the TNC with a 20 pin flat ribbon cable. The trimmer for output voltage can be accessed through a window on the TNC3 rear panel. The radio transceiver is connected via a 5 pin standard DIN plug. The FSK9601 is a FSK-modem which receives and transmits data according the G3RUH-standard. It produces a band-limited data signal with 9600 baud data rate and can be modified to other speeds from 4800 up to 614k Baud by changeing some components and jumpers. The FSK9601 transmit filter and receiver design was developed by Ulf Kumm, DK9SJ. The scrambling algorithm is compatible with the G3RUH standard, the PGA design was derived from a design of DF9IC. muting: the transmitter is muted when receiving. bit-error-test jumper: a constant '1' may be transmitted when the according jumper is closed. transmit jumper: for tests, the modem may be set to continuous transmit mode by a jumper. high impedance input (100 kOhm // 100pF) 50 - 500 mV input voltage required. output voltage adjustable 10 mV to 3 V, 2 kOhm series resistance, DC-decoupled. FIR-filter programmed for FSK (cos-rolloff characteristics) and GMSK filter response. 128-tap FIR-filter with 128 taps (16-fold oversampling x 8 bit length). The digital filter produces a minimum of distortions and harmonics. flexible baudrate: the board is designed for a variety of transmit and receive baudrates, ranging from 4800, 9600, 19200, 38400, 76800, 153600, 307200 up to 614400 Baud FSK. Transmit and receive baudrate can be selected different, e.g. for satellite use with 9600 Baud uplink and 38400 baud downlink.